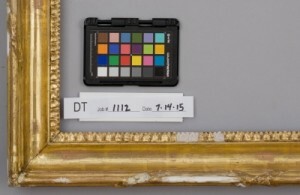 When a period gilt-gesso frame for an 18th-century portrait by the Chinese painter Spoilum arrived at Harvard Art’s conservation studio earlier this year, it was covered in a grimy layer of oil gilding—part of an old restoration that masked the frame’s original appearance. Although an initial test proved that water gilding lay beneath the surface, Sue Jackson and her team didn’t know what its condition was. After removing all of the oil gilding, they found that the water gilding was beautifully executed and aged perfectly for a work from the late 1700s. 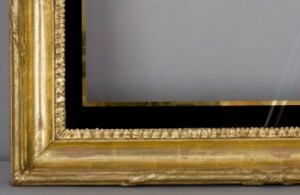 After this fortunate discovery, the conservation team fixed previous faulty repairs to the frame’s tongue-and-dart ornamentation, stabilized the frame’s corners, and filled gesso losses. 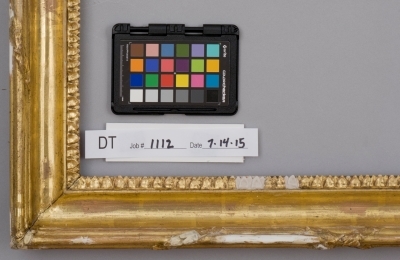 The surface repairs were then gilded and toned to match the frame’s original water gilding and purple/brown bole—a fastidious process that helped make Harvard Art’s restoration as discreet as possible. 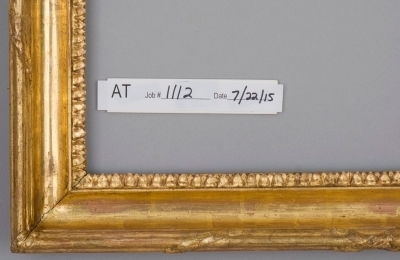 Because the Spoilum work was considerably smaller than the frame, Harvard Art worked closely with the painting’s conservators at Anthony Moore Paintings Conservation, a private painting conservation company, to customize the frame so that it would correctly house and protect the canvas. Harvard Art installed a glass mat that replaced an earlier glass mat, adding a tailor-made spacer to keep the glass away from the painting’s surface. 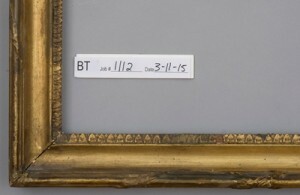 A back frame was also added to fill the large gap between the gilded frame’s opening and the smaller canvas. 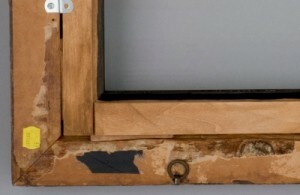 New hanging hardware was affixed to the frame’s back and its original hanging hardware was left on, preserving that part of the frame’s history while ensuring the painting a safe home on its owner’s wall.